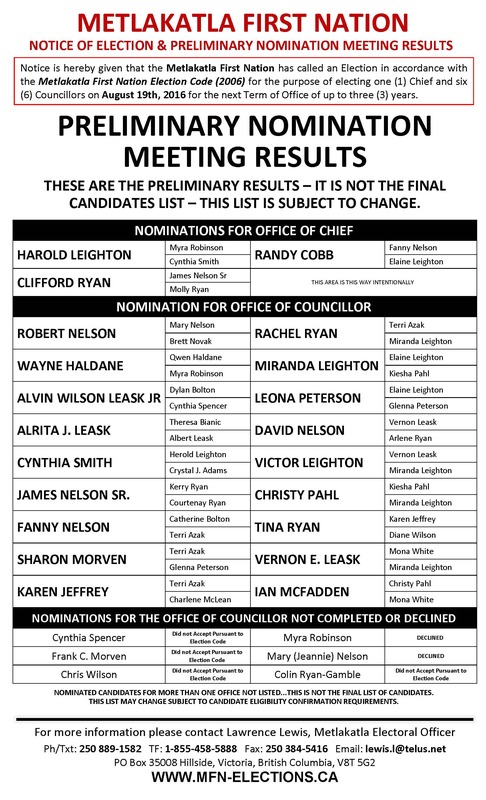 Click here to view the preliminary Nomination Meeting results. These are the preliminary results - it is not the final candidates list - this list may be subject to change. All Metlakatla members welcome! Join us to celebrate the grand opening and blessing of our new sports field and skate park! Come out and watch the skate park demonstration, play bubble soccer, and eat some yummy lunch! For this special grand opening, there will be a ferry leaving Prince Rupert at 11:15 a.m. and returning from Metlakatla at 3:30 p.m. Space is limited and passengers will be accommodated on a first-come, first serve basis. The annual food fish program is now taking place and members are excited about receiving food fish this year. Please be advised Metlakatla Governing Council does not want vessels of any size tying up at the Prince Rupert dock any longer than a day and no overnighting on the outside of the dock during the food fish program. This space is required for vessels off-loading food fish in Prince Rupert. Signs are posted in clear view stating long term moorage is not permitted due to limited space for moorage. Metlakatla fisheries is now accepting halibut and sockeye from fishers as part of the 2016 Food Fish Distribution program. 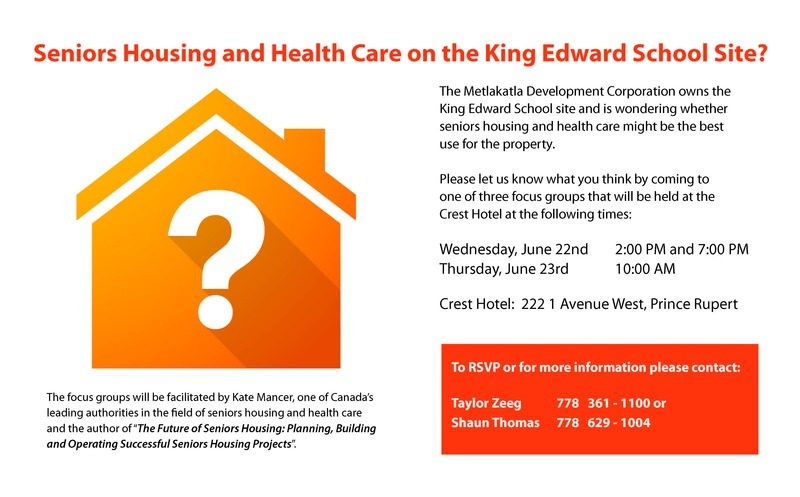 The Metlakatla Development Corporation is looking for your input on the possibility of creating Seniors Housing and Health Care on the old King Edward site. If you are interested in seniors housing or health care, please plan to attend one of two focus groups on June 22 or the focus group on June 23. Click here for more information. For those of you who didn't get the chance to watch the Metlakatla drone, the Metlakatla Fisheries Program, with the help of the Skeena Area Marine Research Collaborative, completed the first stage of an eulachon predator study using drone technology this spring. Metlakatla Fisheries staff launched a small drone from several locations in the Skeena estuary, as well as from the banks of the Skeena River, in order to search for predators such as seals, sea lions, eagles and seagulls. The Metlakatla Governing Council is aware of the decision of the Prince Rupert School District to no longer fund ferry service to transport Metlakatla students to Prince Rupert for school. While we understand the budget pressures facing the district, Chief and Council will be working with other levels of government and discussing the situation internally to find a resolution ahead of the start of the 2016/2017 school year. The latest Metlakatla column in the Northern View, outlining the Metlakatla Fisheries Drone and Food Fish programs for 2016, can be viewed here. · The 7:30 a.m. ferry leaving Prince Rupert and the 3:45 p.m. ferry leaving Metlakatla have been cancelled for the week. · The 4:30 p.m. ferry leaving Prince Rupert and the 4:45 p.m. ferry leaving Metlakatla on Thursday, March 24 have been cancelled. The last ferry of the day will leave Metlakatla at 12:45 p.m. on March 24. The Metlakatla Stewardship Society, on behalf of the Metlakatla First Nation, filed its response to the Canadian Environmental Assessment Agency’s draft report for the Pacific Northwest LNG project on March 10. The response includes comments regarding the conditions listed in the report and a number of conditions Metlakatla would like to see placed on the project should it proceed.